The Aquidneck Island Planning Commission (AIPC) announced in a release today that Mary Alexandre has joined its staff as Development & Communications Manager. In this new position, Ms. Alexandre will create and implement fundraising and communications strategies to fund AIPC's current growth and to position the organization for expansion in the near future. Ms. Alexandre brings a rich knowledge of the East Bay and Aquidneck Island area to AIPC. 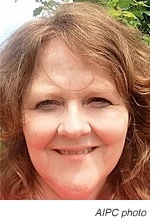 She was a journalist with East Bay Newspapers for ten years and a freelance writer and editor for several local Patch.com sites and other publications. She has served in fund development leadership roles at Boys Town New England England and St. Philomena School, both in Portsmouth; and most recently, The College Crusade of Rhode Island in Providence. "I am so excited to be 'back home' again in the East Bay area," she said. "I look forward to bringing together my backgrounds in journalism, communications, and development to help AIPC expand its important role as an advocate for Aquidneck Island. We have to keep this very special island the jewel that it is, now and in the future." Ms. Alexandre, a graduate of Framingham State College with a degree in media communications and writing, is a longtime resident of Bristol, along with her husband and four daughters. The Aquidneck Island Planning Commission (AIPC) is a non-profit organization working to preserve and improve the environment and quality of life on Aquidneck Island, in partnership with the communities of Middletown, Newport and Portsmouth. AIPC leads and supports planning and action to ensure that Aquidneck Island remains dynamic, sustainable and connected, for the benefit of residents, businesses, and visitors. This letter to the editor from Sen. James Sheehan (D-36) was distributed for publication by the state house press office. Last Sunday, the University of Rhode Island hosted a competition which pitted student teams against each other in defending their moral take on complex social, political and business issues. This inaugural event was called the Rhode Island High School Ethics Bowl. Coincidentally, the annual “State House Ethics Bowl,” restoring the Ethics Commission’s jurisdiction over the General Assembly, kicks off again this session at the state capitol. The Ethics Commission was created to be the citizens’ watchdog over public officials and their actions, with specific authority over the General Assembly. As a result of a 2009 ruling, in a case involving former Senate President William V. Irons, the Ethics Commission’s oversight over the General Assembly was struck a severe blow. The ruling effectively exempted state lawmakers from scrutiny and prosecution by the state Ethics Commission for violations relating to their core legislative acts such as introducing and voting on legislation. Since then, a senator or representative can freely promote legislation wherein he or she has a clear conflict of interest without fear of being held accountable by the Ethics Commission. This “legislators’ loophole” must be closed. The late Sen. J. Michael Lenihan took up the effort to restore the jurisdiction of the Ethics Commission following the 2009 decision. I proudly took up the banner of ethics reform after Senator Lenihan retired in 2010. Further, at the behest of Senate President Teresa Paiva-Weed, I have worked to find a common ground compromise on ethics reform. Working with various stakeholders, including voices of good government watchdogs, the Senate, and the Ethics Commission, I believe we have forged a very reasonable ethics reform amendment. As with most compromises on contentious issues, no one was completely happy with the resulting text, but nearly everyone agreed that it represented a genuine opportunity to bring closure to this issue. This common ground Ethics Amendment would re-establish the authority of the Ethics Commission over the core legislative acts of the General Assembly while preserving the venerated right of “free speech” for lawmakers on the floor or in committees of both houses. Further, the amendment would afford any person a trial by jury appeal for a violation of the Code of Ethics deemed criminal in nature at common law by the state's [high] court. Lastly, the proposed amendment would set the composition of the Ethics Commission into the constitution as well as balance the number of Ethics commissioners nominated by the House and Senate leaders. Rhode Island citizens do not trust their government, especially the General Assembly. In a Fleming and Associates 2016 poll of what issues Rhode Island voters want the General Assembly to address this year, “Government corruption” was ranked second (behind creating jobs). Restoring the jurisdiction of the Ethics Commission over the General Assembly would represent a great step forward in rebuilding the people’s trust in government by deterring future instances of public corruption. The only question is whether Senate and House leaders will decide to act on Ethics Reform or will prefer to maintain a festering status quo. Senator Sheehan is a Democratic senator representing District 36, which includes Narragansett and North Kingstown. He is chairman of the Senate Government Oversight Committee. He resides in North Kingstown. The Portsmouth Water and Fire District holds its annual election of officers on Wednesday, June 10 at the District main office at 1944 East Main Road, and everyone who is a ratepayer in the district can vote. Polls open at 7am and close at 8pm. This year, four positions are up for election -- one Tax Collector, one Treasurer, and two Tax Assessors. All four races are uncontested, with incumbents running for re-election. For Tax Collector, Fred Faerber is seeking re-election, incumbent Treasurer Allen Shers is seeking another term, and Tax Assessors Ted Czech and Michael Nott are also running for re-election. As I remind people every year, this is one of those rare elections where write-ins can (and, in the past, have) resulted in upsets, so I urge everyone to take a few minutes out of your day to stop by and vote. I'll remind you. Editorial note: Written substantially from a press release. The Portsmouth Water and Fire District’s annual Consumer Confidence Report (CCR) was mailed to customers on June 25th and 26th, according to a release from the District. The CCR indicates that the District’s drinking water met or surpassed all Federal standards in 2013. According to the CCR, the District does not own any water supplies, but purchases its regular water supply on a wholesale basis from the Newport Water Department and relies on the Stone Bridge Fire District in Tiverton for emergency water supply. The CCR, which is required of all public water suppliers by the Federal Safe Drinking Water Act, summarizes the District’s water sources and provides information on regulated and unregulated contaminants in the water. 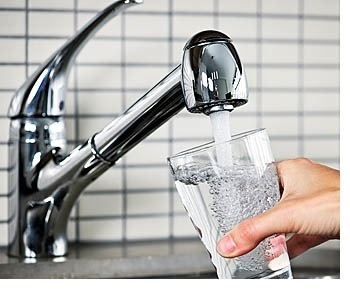 The CCR also provides important health information on drinking water, including bottled water, particularly for those people that may be immunocompromised. The CCR also provides health information about specific water quality issues and indicates that the District continues to experience high levels of Total Trihalomethanes (TTHMs), which are a by-product of drinking water chlorination and are a suspected carcinogen. The CCR shows that in 2013 the District’s highest four-quarter Running Annual Average TTHM level was 96.3 parts per billion (ppb), which is above the EPA Maximum Contaminant Level of 80.0 ppb. The range of TTHMs measured in the distribution system was 21.5 to 134 ppb. TTHMs are an on-going concern for the District, Newport Water and the Navy, as all three island water suppliers are distributing the same treated water. The CCR indicates that the City of Newport has awarded a design-build contract for the construction of a new Lawton Valley Treatment Plant in Portsmouth and improvements to the Station 1 Treatment Plant in Newport. The total project cost is $84 million. Due to the challenging water quality of the City of Newport’s nine reservoirs, Advanced Water Treatment processes are incorporated into the improvements at each plant in order to assure compliance with drinking water standards, particularly TTHM standards. The plants are scheduled to be operational before the end of 2014. All water users on the island will pay for these improvements through increased water rates. Copies of the report are available at the District’s main office at 1944 East Main Road and the Portsmouth Free Public Library. The report is also available on the Internet at portsmouthwater.org. PWFD announces "Drinking Water Week"
At the April 15 board meeting of the Portsmouth Water and Fire District, Chairman Philip T. Driscoll read a proclamation declaring May 4, 2014 through May 10, 2014 to be Drinking Water Week, and asked all customers of the District to join in promoting and practicing water conservation in our daily lives. During Drinking Water Week the Portsmouth Water and Fire District will be promoting water conservation. Driscoll said that every water user can have an impact by being 'water wise.' "We are not saying 'don't use the water', we are saying 'don't waste it'." For the twenty-fourth consecutive year, the District will conduct a water conservation program for the town's third and seventh grade school children. The program aims to increase each student's awareness of the importance of water in their lives and to teach them how to conserve water. The emphasis of the program is on changing the water use habits of the children and their families through simple, commonsense techniques. This education program continues to be well received by the Portsmouth school system. Read more about PWFD announces "Drinking Water Week"
Governor Lincoln Chafee, joined by U.S. Senator Sheldon Whitehouse, other government leaders and environmental advocates at the West Warwick Regional Wastewater Treatment Facility, today signed an Executive Order, which creates the Rhode Island Executive Climate Change Council (ECCC), according to an RI.gov press release. The ECCC will advise the Governor, the General Assembly, and the public on best practices to ensure that the state continues to be a national leader in developing and implementing strategies that address challenges created by climate change. "I am establishing the Council because for too long there has been strong evidence and scientific consensus that manmade greenhouse gases will have profound effects on global climate, weather patterns and ocean conditions; effects that the state cannot afford to ignore," Governor Chafee said. "Rhode Island must act boldly to position the state as a national leader in climate adaptation with a comprehensive approach that will benefit our communities and businesses." The Director of the Rhode Island Department of Environmental Management, Janet Coit, will chair the ECCC, and it will include the leaders of the following State agencies: Coastal Resources Management Council; Department of Administration; Department of Transportation; Department of Health; Emergency Management Agency; Office of Energy Resources; Division of Planning; and Rhode Island Commerce Corporation. "Rhode Island is already seeing the effects of climate change through coastal erosion, higher risk from storm surge, and shifting seasons and fisheries," said Senator Sheldon Whitehouse, Co-Chair of the Bicameral Task Force on Climate Change in the U.S. Congress. "Governor Chafee, like his father John before him, has long advocated for stronger environmental policies. The executive order announced today builds on that long legacy of environmental leadership and will help Rhode Islanders prepare for the changes ahead while also reducing the carbon emissions that are causing them. I thank the Governor for taking this important step." Among its initiatives to develop long-term strategies to prepare for the impacts of climate change, the Council is tasked with working with the cities and towns to help prepare communities, as well as identify and leverage federal, state, and private funding opportunities for emission reduction. Rhode Island's collaboration and partnership will continue with other New England governors and the Eastern Canadian premiers to explore areas of mutual interest to achieve common environment goals. "Climate change is one of the biggest challenges we face when it comes to ensuring the health and resilience of our natural resources, infrastructure and quality of life," said Department of Environmental Management Director Janet Coit. "I look forward to working with the Council over the coming months to develop an action plan that will address the impacts of climate change on Rhode Island." "Individually Rhode Island agencies have been doing work on climate change that is considered to be in the vanguard as far as national efforts go," said Grover J. Fugate, Executive Director of the RI Coastal Resources Management Council (CRMC). "The council which is set up by this executive order will provide a platform to coordinate these activates and enhance the value to all citizens of the state and place Rhode Island in a leadership position nationally on the critical issue." "State agencies play a central role in guiding public policy and overseeing critical investment decisions that have long-term consequences," said Jonathan F. Stone, Executive Director of Save The Bay. "By establishing the Executive Climate Change Council, the Governor is taking an important step forward in integrating and coordinating actions by state agencies to reduce greenhouse gas emissions and advance sound public policy that anticipates what lies ahead." The executive order calls for the Governor to receive a formal report with findings, recommendations, and a status update on achieving the objectives by May 1, 2014, with subsequent reports due yearly on May 1. From the dead tree edition. Today's ProJo featured a tiny little letter to the editor (cut for length and, in my opinion, editorial slant) responding to a global warming hit piece by Mike Stenhouse. Here's a scanned pdf, or you can see the edited version online (including a back-and-forth in the comments with some climate deniers, including The Stenhouse himself). 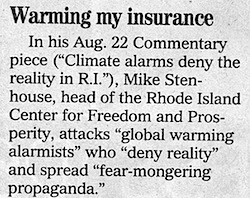 In August 22 Providence Journal commentary ("Climate alarms deny the reality in R.I."), Mike Stenhouse, CEO of the RI Center for Freedom and Prosperity, attacks "global warming alarmists" who "deny reality" and spread "fear-mongering propaganda." He singles out a recent Providence event in which two youths with asthma were -- in his words -- used as "props" to show the impact of climate change. One would think Mr. Stenhouse might be a tad circumspect about calling children props, given his Center's use of student essays to push "school choice" just a month ago: http://www.rifreedom.org/2013/07/school-choice-essay-contest-winners. But that's beside the point. This is not abstract. For the second year in a row, I have paid more for home insurance than property taxes. I live in Portsmouth's Island Park, in a 900-square-foot cottage that my grandfather bought in 1920, and we are 15 feet above mean high tide. Even the cheapest rate, with RI Joint Re, still makes home and flood insurance nearly twice my property taxes. Greed? No. Grim actuarial statistics. As we continue to pump gigatons of carbon into the atmosphere every year, we face an increased risk of weather extremes exacerbated by global warming. And that risk is quantifiable. Those of us who live near the water see it in our premiums. If Mr. Stenhouse truly cared about the "prosperity" of everyday Rhode Islanders, he would be working to fight both this enormous economic drain and the long-term impacts global warming will have on the well being of all the Ocean State's citizens. Since I wrote this, there was a frightening piece on insurance in the Warwick Beacon, an explainer on flood maps in the EcoRI News, and a long piece on new models for estimating risk in this weekend's NY Times Magazine. Also, how much more helpful would it be if folks like the RI Center for Freedom and Prosperity, the RI Current, and the Rhode Island Shoreline Coalition fought things like this that cost middle class families thousands of dollars a year, instead of picking fights over trivialities just to rile up their base? AP Enterprise, the company capping Portsmouth's Island Park landfill, has filed a request for an additional year to complete the last 20% of the project, according to documents distributed today by Mark Dennen of the RI Dept. of Environmental Management. The "Beneficial Use Determination," under which the work has been proceeding, is set to expire on September 17. 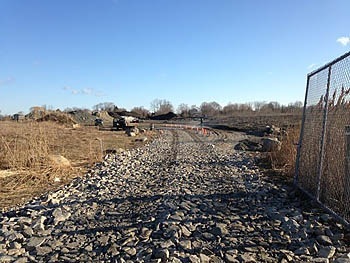 Writing for APE, environmental consultant Tim O'Connor blames the "constraints imposed by both the replacement of the Sakonnet River Bridge and the weak economy" for the slow progress: "A number of competing landfills had temporarily closed," O'Connor explained, which had provided a stream of material. "The competing landfills are back open and Boston soil cannot be economically shipped to Portsmouth at this time." Also, O'Connor noted, "The sources of soil in our market area of Rhode Island have not been sufficient to find all the necessary shaping and grading material as well as final cap. However, the slow improvement of the local economy should provide enough material to finish in the coming months, but, certainly not by September." And the Sakonnet River Bridge -- which previously was blamed as a problem for trucks because of weight limits -- now comes in for a new criticism, as O'Connor says that shipments to Portsmouth will be "further discouraged by tolls." "The primary reasons the project has not been completed are beyond APE's control," O'Connor said, asking RIDEM to grant the request for additional time. Also in today's communication from RIDEM is a letter closing an issue with soil exceeding the residential limit of 7 mg/kg not being immediately covered, following an on-site inspection that showed "the site is in compliance." Dennen reminds APE of their obligation: "Please be advised that you are responsible for continued compliance with all of the conditions of your 2012 Beneficial Use Determination." Links to the request for extension and compliance letter. Vote for Portsmouth Water Board today! Please take five minutes today and head down to the Portsmouth Water & Fire District to vote in their Board election. Both of the incumbents, Joe Magliocco and Ron Molleur, have been doing a good job and deserve another term. I know it's a pain to stop by the office at 1944 East Main Road, but this is one of the few elections -- anywhere -- that a write-in candidate can actually win. It has happened in the past. Five minutes. East Main Road. Vote for the "M"s. Thanks! Read more about Vote for Portsmouth Water Board today!